"Great instructor and equipment! Take your NIMS classes here. The equipment is t . . . The Vincennes University HTEC Teacher Training Center has posted its training schedule for CNC classes through August 2019 that include 2 new introductory level classes. Doug Bowman, Director of the Vincennes University Teacher Training Center had this to say about two new classes "We are excited to help new CNC teachers overcome the sometimes intimidating nature of the machines, and to give them extra time to become comfortable programming, . . . The September 2018 issue of Modern Machine Shop magazine contains a 9 page article on VU HTEC partner Flying-S Inc., a thriving aerospace company in Southeastern Illinois just 30 minutes from Vincennes. The piece highlights how Flying-S processes machined aerospace parts efficiently using the latest technology and advanced processes. It also discusses how they partner with Vincennes University to train and grow their CNC machining workforce, and to develop new machining processes. The article can be found on page 88 of the September issue of MMS, and is also available in the resources section . 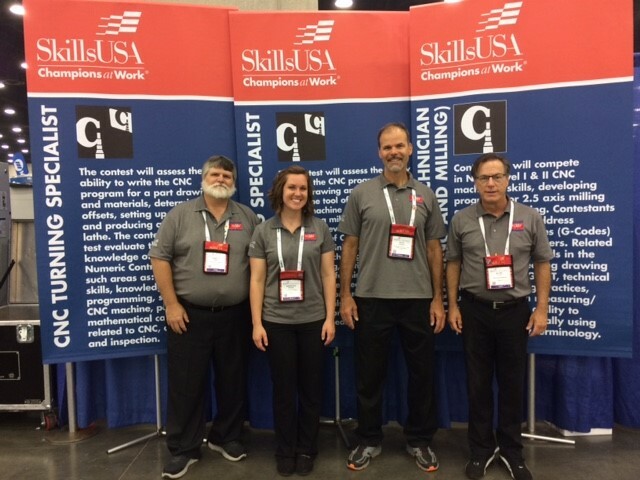 . .
From left to right in the picture are Bob Nash, Samantha Parker, Doug Bowman and Dan Flick. Bob Nash is an Instructor at the VU Haas Technical Education Center on the main campus at VU and served as a contest judge. Samantha Parker is a graduate of the VU Right Skills Now - CNC Machining program and she ran parts on the Haas CNC machining center and turning center. Doug Bowman is the VU HTEC Director and he served as a contest judge. Dan Flick is the Director of the Gene Haas Training and Education Center located in Lebanon IN, and he also served as a contest judge. Using solid models designed by the students in the Product Design program at Vincennes University, the staff and students in the VU HTEC programmed, setup and machined the components for a new university mace. 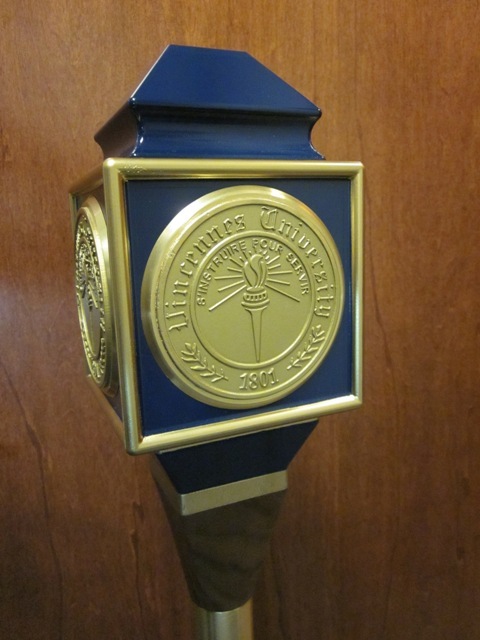 The mace is used at each graduation commencement ceremony to represent Vincennes University. The project required a variety of machining techniques including 5-axis machining on the Haas UMC-750. The new mace was used for the first time at the 2018 commencement and will be used for many years to come. 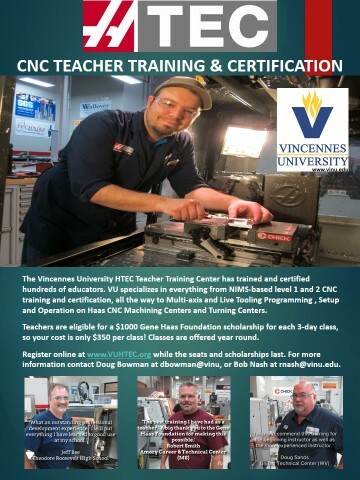 If you are interested in coming to Vincennes University for CNC Teacher Training this summer or fall, now is the time to register while there are still seats available, and there are are still Gene Haas Foundation Scholarships available.